You’re sitting down to dinner with your family or friends when the doorbell rings. You go to the hallway, peer through the frosted glass and—blast it!—it’s a salesperson. It’s often just a youngster selling chocolates for school fundraising or a university-aged student repping a charity you don’t usually support. Those calls you can live with—the little kids are cute, the young adults need the cash and charities rely on door-knockers to fund their work. But it’s another breed of salesperson that’s causing some of you to fear opening the door: the high-pressure huckster, pushing a furnace, air conditioner, water heater or water treatment system. 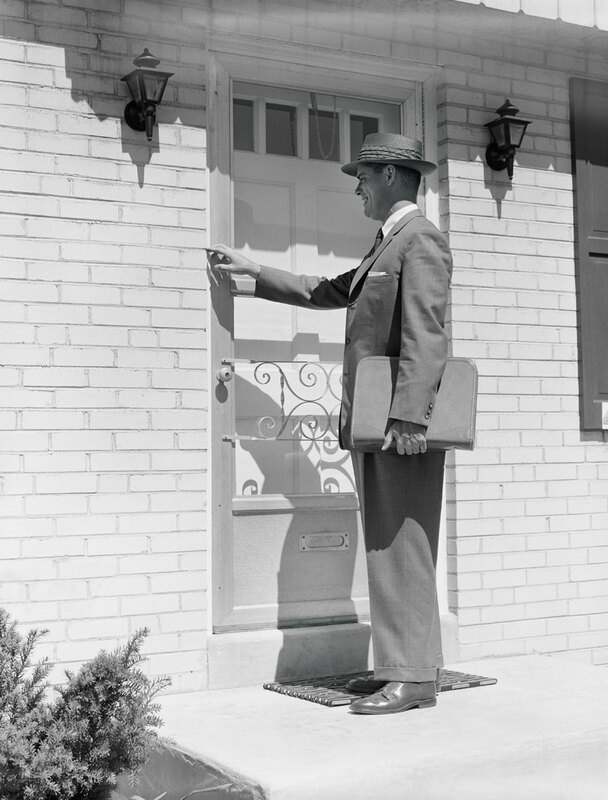 Today, door-to-door salespersons are known as direct sellers, and they sell anything from cosmetics, home-care products and vitamins to home heating products and services. According to the Direct Sellers Association of Canada (DSA), there are more than 800,000 of them in Canada, 61 per cent who favour your home as the place of their sales demonstration. And while most of them are legitimate, polite and on the up-and-up, there’s an unfortunately high number who give the industry a bad name, resorting to deceptive sales pitches, straight-out lies and bogus “limited-time offers,” all couched in a highly aggressive attitude aimed at forcing you to sign on the dotted line. Why do these salespeople prey on seniors? Partly, it’s due to the fact the older generation is less cynical and more trusting. And some of it is related to the psychology of aging. A study conducted by the Stanford Center on Longevity—Age-Related Differences in Deception—found that older people have a much more difficult time differentiating between lies and truths. Basically, they don’t have fully operational BS meters. That’s why sharp salespeople—keen students of human psychology—target seniors as A-1 prospects and have a much higher rate of sales with them than with any other age group. It’s an old but extremely effective tactic that’s worked since the advent of door-to-door sales. McCann signed a contract for a new furnace. Six months later, another salesperson called, this time to test her home’s water quality. Again, he deemed her water quality was poor, suggesting it would be best to install a treatment system. By the time her son discovered what was happening, she’d already had the furnace and treatment system installed. After those experiences, McCann is understandably wary of answering the door to anyone at all. “Now, if it’s a salesperson, I just say no right away,” she says, though sometimes that’s not enough to deter the more persistent ones. As caregiver to a husband suffering from dementia, she says many people in her situation are intimidated by direct sellers, especially those who include deception and bullying in their repertoire of tricks. The practice has become such a scourge that some communities are fighting back, passing bylaws to regulate the worst aspects of door-to-door sales. In 2012, Parksville, B.C.—a community of 12,000 on the east coast of Vancouver Island—city council banned the practice after receiving numerous complaints from its older residents, who comprise 30 per cent of the population. “We were having too many issues with door-to-door selling,” says Aaron Dawson, senior bylaw compliance officer in Parksville. “So we brought forward a bylaw to council, and they adopted it.” Under the bylaw, direct sellers are not allowed to “canvass or solicit at any residential premises for the sale of security services, home repairs or alterations.” Companies can send out flyers, but they can only call on someone’s home if that person requests information. Dawson points out that the aim is to stifle unsolicited and high-pressure sales and that religious institutions, charities and non-profits are exempt from the restrictions. Wellington North—a small community in Ontario—passed a similar bylaw in July 2016, stipulating that door-to-door salespeople must first obtain a licence from the township and have written permission from the homeowner before they even knock at your door. That’s why CARP is watching the progress of a private member’s bill in Ontario, calling for all parties to support legislation that would place strict restrictions on direct sellers. Last year, Yvan Baker, Liberal MPP, launched Bill 193: An Act to Prohibit Door-to-Door Sales. The proposed legislation would ban direct sales of water heaters, furnaces, air conditioners or water treatment devices, stipulating that any contract signed within the home would be deemed invalid. There are also stiff penalties in place to punish offenders, a $2,500 fine for individuals and up to $25,000 for companies. Baker’s original bill died when Parliament prorogued and was reintroduced as Bill 14 this session. While it’s scheduled for third reading, there’s no guarantee it will pass. But even if it fails, Poziomka feels it’s a worthy inititative. “It would be the most comprehensive of its kind in Canada,” he says. All provinces allow direct selling but give people a cooling-off period of 10 to 15 days to cancel their contract. However, some companies hide the cancellation option or simply show up on the doorstep next day to commence installing, not giving the homeowner a chance to consider the purchase. Poziomka adds that he’d like the Ontario bill to go even further, banning all door-to-door sales, not just furnaces, air conditioners and water treatment systems. Ultimately, when direct sellers come to your door, you can refuse to answer in the hopes they’ll move on to your neighbour’s house. But should we be reduced to cowering in the hallway just because we don’t want to be hoodwinked by a pushy salesperson? If Baker’s law goes through, it will serve notice to these companies to take their products and their aggressive sales pitches and stop annoying us during dinner time. 50% said they’ve had a salesperson call on their home to sell, rent or lease a new furnace, air conditioner, water heater or water treatment system. 30% who purchased a product or service at the door said they were dissatisfied with it. 65% said governments aren’t doing enough to address complaints against door-to-door sales. 78% would support legislation in their province banning door-to-door sales of heating, air conditioning, water heaters and water treatment systems. Pushy or fraudulent salesmen don’t limit themselves to knocking at your door—they’ll come into your home via telephone and email scams. Here are some to look out for. Canadian Revenue Agency Scam An email that purports to be from the Government of Canada arrives, stating that you have a tax refund waiting or that you owe the government money. The email asks you to fill in personal information (bank account and SIN number) and then uses that to steal from your account. The CRA never asks you to send personal or financial information via email. Computer Repair Scam A “technician” calls you claiming to be from a big computer company, saying your system needs an upgrade. He’ll do it for free, as long as you provide your password. Don’t ever provide your password on the phone or through email. It will be used to access your computer’s hard drive. Invoice Scam You get an online notice from a legitimate company saying you owe money for a product or service you can’t remember buying. Romance Scam Using a fake profile on a dating site, a con man builds close relationships with women. Playing on their affection, he asks them for access to their bank account, credit cards, passports or any other personal information. Ask all salespersons to show identification. Don’t be deceived by fake badges: utility companies, municipalities, government agencies will not send salespeople door-to-door. Never let a direct seller look at your furnace, water heater, etc. They’ll always find something wrong with it or deem it unsafe. Ignore all limited-time offers—they’re common features of the high-pressure sales pitches. Contact the Better Business Bureau (www.bbb.org) to see if the company they’re representing is reputable. If you are interested in the product or service, shop around to make sure their price is competitive with other companies. Never sign a contract at the door. Ask the person to leave the information and say you’ll get back to them. All provinces have a cooling-off period, allowing you to cancel a contract within 10 to 15 days. A version of this article appeared in the December 2016/January 2017 issue with the headline, “The Salesman Always Rings Twice”, p. 67-69.